While Atlanta’s upscale Buckhead neighborhood is long-established as the destination for fashionistas and boasts three high-end shopping complexes earning the nickname, “Rodeo Drive of the South,” Atlanta is also a hotspot for collectors and antique hunters drawn to the city’s concentration of antique shops and markets. Scott Antique Market, self-proclaimed as “America’s Favorite Treasure Hunt,” is the worlds largest, monthly-indoor antique show. Shopping collectives and co-operative showrooms across the city feature the works of local artisans and provide a place to incubate local talent. AmericasMart Atlanta is the nation’s only global wholesale marketplace housing the world’s single-largest collection of home, gift, area rug and apparel merchandise. Atlanta has the second-and third-largest malls in the Southeast, Perimeter Mall and Lenox Square, which are both located within the metro area. 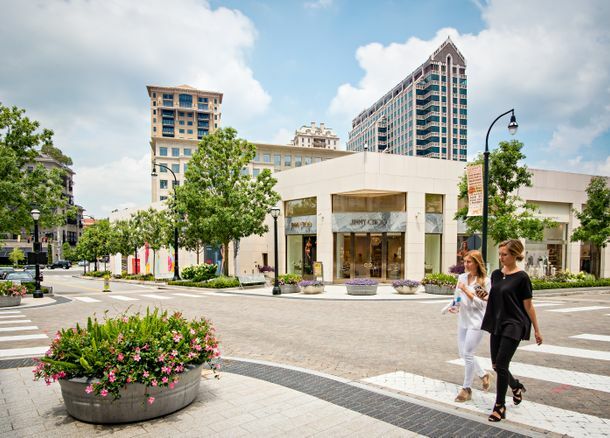 Atlantic Station, designed as a city within a city, boasts 138 acres of outdoor shopping, dining options and greenspace.